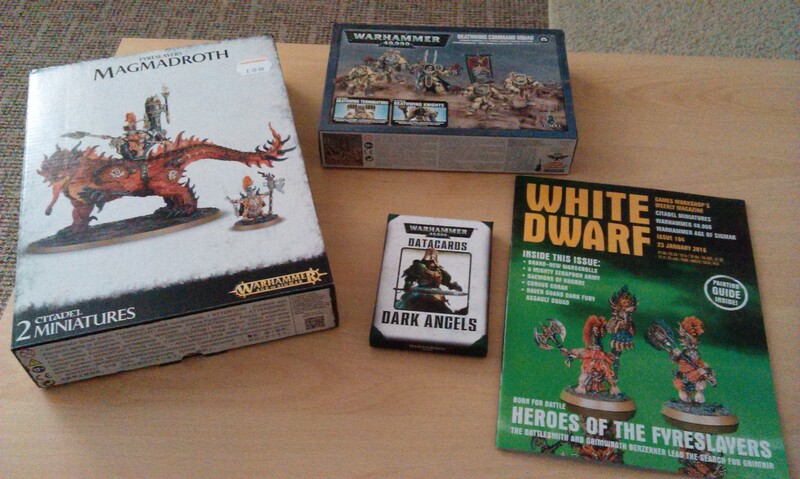 New stuff from Games Workshop! Not only are we getting three xenos codexes, but the next one coming (after the Thousand Sons) is my very own Dark Eldar! Okay, so they’re Drukhari now, so I suppose I should start to call them that, but it’s a very exciting time for this! We don’t know when precisely it’s due, of course, but it’s coming, and that’s alright for now. 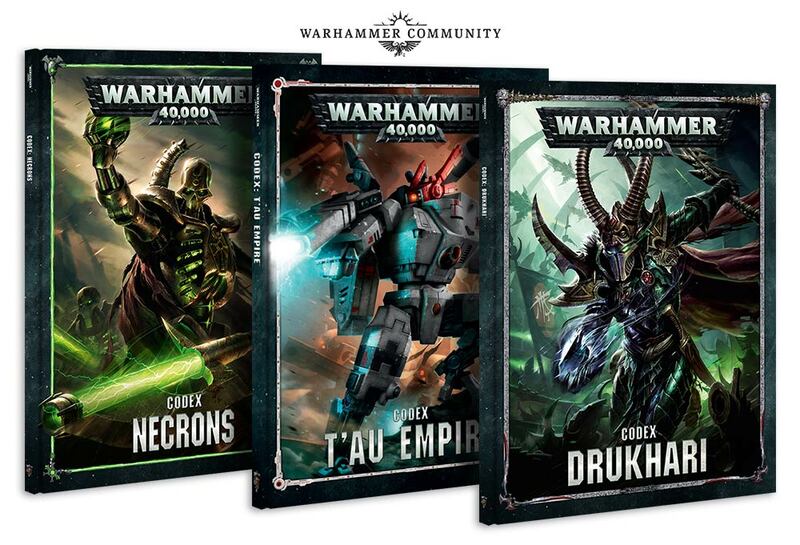 No new models have been announced for the Drukhari, but my other army, the Necrons, are also getting a book – which, apparently, will deviate significantly from their Index presence, so that’s exciting – and a plastic Cryptek, which is something that has been talked about for quite some time now! This chap looks both immense and hilarious, and I will definitely be picking one up for my dynasty. I’m not really into the Tau chaps, though it is still very cool to have more xenos in book form now, I must say! Of course, we’re still currently in thrall to the Boys in Gold, although I am excited about getting a Thousand Sons codex next weekend. I’ve been planning a joint Thousand Sons-Death Guard army for a while, so I think it will be good to get moving with that sometime. I also like the look of the Thousand Sons for allowing big monsters into the army, such as the Mutalith Vortex Beast. I suppose that’s something that attracts me to Tyranids in 40k, having big monsters on the board in addition to the grim-dark feel of the gothic far future. Anyway, I’m rambling here! This looks amazing. If anything could tempt me into the mortal realms right now, I think it would be snake-ladies with Greek-style face masks and a Medusa vibe. I can definitely see myself picking some of these guys up this year, despite the huge backlog of projects I already have on the go! People have been talking about them for possible Wych Cult conversions, but I think I’d be getting some purely to have for their own merits. As I said earlier, I enjoy having huge monsters in an army, and there is one very big snake-person teased in this video, which looks like it would be incredibly cool! I’ll have to think carefully about this one! Intriguingly, this has also whetted my appetite more than I thought would be possible! I’ve not paid much attention to the actual game of Shadespire, as I’ve been on my 40k kick for so long that I haven’t really had the time, but I’ve noticed the new factions for Skeletons and Orcs, so was aware of the whole thing. But then this thing cropped up, and I find myself thinking, “yeah, they look cool!”. I have previously been tempted by the Fyreslayers, and had bought some kits that I eventually off-loaded, but having just four guys could well be the way to go! Author spalanzPosted on January 27, 2018 Categories WarhammerTags Age of Sigmar, Dark Eldar, Daughters of Khaine, Drukhari, Fyreslayers, Necrons, Warhammer 40kLeave a comment on New stuff from Games Workshop! It’s week three of the new Fyreslayers release, and this week sees the big Magmadroth kit released, along with the Battletome and a collection of short stories telling the tales of the new Slayers in the Age of Sigmar. But what a kit this is! I haven’t actually built it yet, but in looking over the model, I have to say that I’m really impressed. It actually seems smaller than I was expecting, though that may change upon assembly. However, the most surprising thing, to me, was that the instruction booklet for how to assemble it not only has the full rules for the model(s), but also comes in full-colour and features a painting guide! Okay, so it’s not like the usual White Dwarf stuff, but merely a photograph with arrows pointing to specific bits, and a list of the colours and techniques used to achieve that look. I have to say, I’m really impressed with this bad boy. Hopefully we’ll see similar things for the big centrepiece models in the future, as well! First up, we get two more heroes for the new faction, the Battlesmith (standard bearer) and Grimwrath Berzerker (company champion). The latter has some crazy rules whereby he never quite dies immediately, but the former has a rule that I think could be hilarious in practice. He’s a kind of bard as well as a standard bearer, and one of the things he can do is provide an inspirational presence to those duardin around him – by reciting tales of the ancestors. You just know I’ll be getting this model and, when I activate this ability, will start intoning some hilariously bad story from the long, long ago…! Really looking forward to getting this force together as allies for my Stormcasts! The White Dwarf hint has something about Slaves to Darkness, so I’m guessing we’ll be seeing more Chaos stuff coming, then all rumours are pointing to a return to 40k the week after with Space Wolves, so at least February might be a little easier on my wallet! There hasn’t been much time for painting this week sadly, due to degree commitments, but look for my painting update tomorrow regardless, with at least a smattering of Deathwing! Author spalanzPosted on January 23, 2016 Categories WarhammerTags Age of Sigmar, duardin, Fyreslayers, Games Workshop, Magmadroth, WarhammerLeave a comment on More Fyreslayers! So it’s an exciting day today for the new Fyreslayer range – and for Age of Sigmar fans generally, really! 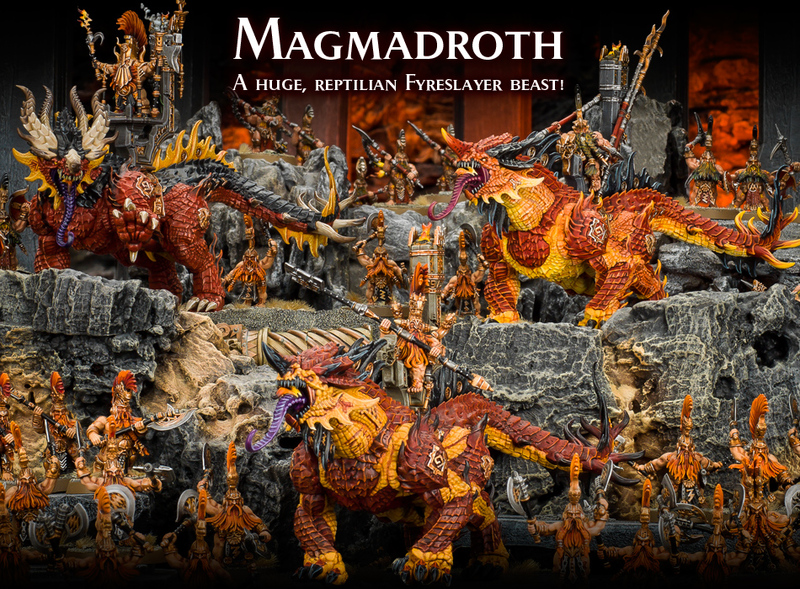 The new Magmadroth miniatures go on preorder, and they look amazing! These models have really gotten me excited for this new army, more than anything ever could, I would say. Is it because I’m Welsh, and the prospect of having a massive fire-breathing dragon in the midst of my models is totally amazing? Well, maybe. I’m certainly going to get myself one of these next week, anyway! I love the fact that they look more like Chinese dragons, in the face at least, and as such I’ve been considering a green colour scheme for mine. Not yet sure how this will turn out, of course, but I guess we’ll have to wait and see! I’m not really one for big models, so I’m a little apprehensive, but hopefully it’ll turn out wonderfully. This week’s White Dwarf is obviously replete with the new mini, and an interesting little tidbit says that, if you choose to build it with either the Runefather or the Runeson on the model’s back, you can build two standing Slayers – only the Runesmiter stops you from building the two standing chaps. I think this is really cool, as a lot of kits often contain parts to almost build more models, though inevitably require some extra bitz, but now we’re seeing something that allows us to get a whole lot more mileage out of the one box. Bravo, GW! This week I also picked up a box of Vulkite Berzerkers, as I think the idea of little men throwing shields around the battlefield sounds hilarious. The kit looks fairly decent – each berzerker’s body is actually in one piece, much like the Ogres, so it doesn’t look like it’d take that long to build up all ten. However, I’ve fallen behind on my degree course, and with less than a fortnight until the next essay is due, I’ve been trying to catch up with that, so haven’t gotten around to building them up yet. I’ve also been trying to crack on more with painting than just endlessly building stuff – the second installment of my progress series will be up at some time tomorrow with the latest news there, anyway! As well as the Magmadroth, next week brings the Fyreslayer Battletome, which I’m likely going to pick up, as I’m finding myself increasingly intrigued by the change from Old World Dwarves to these new guys. The first phase of End Times models is also being re-released in Age of Sigmar branding, which had me briefly nostalgic for those times! The Mortarch kit does look wonderful, of course, and I’ve been flirting with the idea of buying myself one, just for the hell of it. However, one of my new year resolutions was to be more responsible, and so I’m refraining from adding extraneous models to the pile of shame…for now! I’m still waiting impatiently for my Stormcast Eternal cavalry models, too! Author spalanzPosted on January 16, 2016 Categories WarhammerTags Age of Sigmar, duardin, dwarves, Fyreslayers, Games WorkshopLeave a comment on The Magmadroths!